2010 Camaro Cog Drive Upgrade Assembly, 50mm x 75T/32T Cog [4GE118-020] : Supercharger Superstore, Your Online Source for Vortech Superchargers, Paxton Superchargers, Procharger Superchargers, Magnacharger Superchargers and Techco Superchargers! Non-slip supercharger drive for racing applications. Replaces standard Vortech 10-rib supercharger drive and tensioner on existing systems. 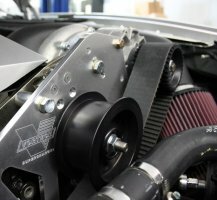 Compatible with existing 2010 Camaro Vortech supercharger system components. Custom ECM programming and fuel / ignition system upgrades will be required when changing the supercharger drive pulley to any size other than what was originally supplied in the complete supercharger kit. This upgrade is only intended to be used with HEAVY DUTY (H/D) Vortech supercharger units. Pairing of this system with any non-H/D supercharger will likely cause supercharger unit failure. Supercharger pulley removal may reduce or void the supercharger unit warranty. Careful size selection is mandatory for proper engine and supercharger longevity. Contact the Vortech Tech Line for assistance with impeller speed calculations if necessary. A Vortech Maxflow Mondo or BV57 compressor bypass valve is required for applications exceeding 12 psig.